My name is Marisol de las Casas, and I am an artist. “I thank Dr. Robert Eisenberg and Project Access for my health. After suffering for more than seven years, I am healthy again, and am able to be the productive and creative person I want to be.” For many years she struggled with health issues that made it difficult for her to paint and make a living. 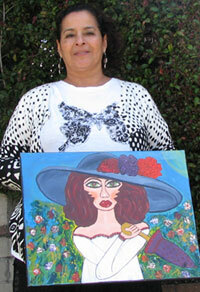 After a hysterectomy in 2004, she developed several health complications. Unable to pay for additional medical treatment, Marisol’s condition worsened until eventually she was unable to control her bladder. The pain and embarrassment she experienced on a daily basis was challenging. After finding Project Access San Diego, Marisol was finally able to receive the medical procedures she needed to correct her health issues and regain her life. She is now pain free and has regained her self-esteem. Look for her around town; she’s back to painting in her signature bright colors and selling her art at local festivals. Dr. Eisenberg has been with Project Access for nearly four years and has helped more than 30 patients regain their health and get back to their lives.